Don't worry, the skittermanders are here to help! In addition to this exciting adventure, this book includes four pregenerated characters that are ready to play, with full stat blocks and backstories. The inside back cover also holds a wealth of information that will help you roleplay the six-armed creatures, such as their species' thoughts on food, religion, and how to relate to other cultures, as well as examples of skittermander slang. 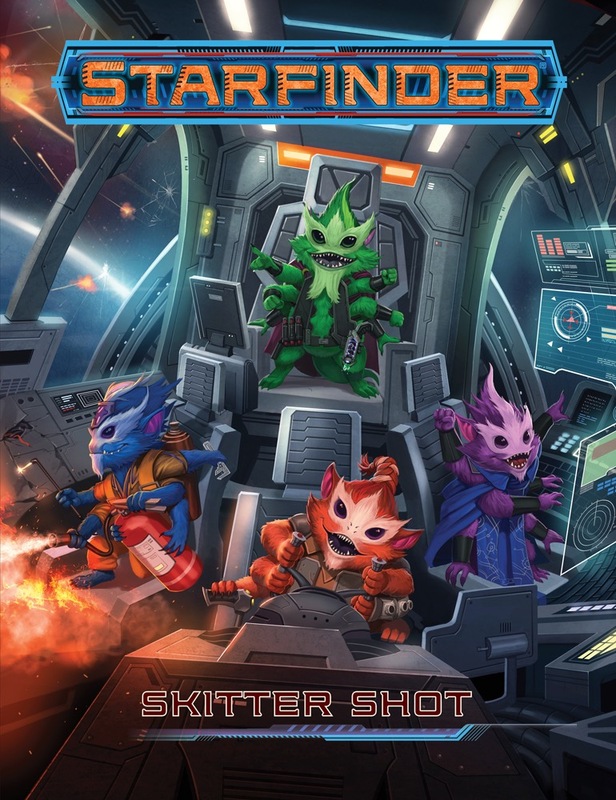 Skitter Shot is an adventure for four skittermander characters who are eager to help those in need and explore a seemingly abandoned starship, written for the wildly popular Starfinder Roleplaying Game. Starfinder Society: This module is sanctioned for play in the Starfinder Society Roleplaying Guild. Pregenerated Characters: This module include four 2nd-level skittermander characters: Dakoyo, Gazigaz, Nako, and Quonx. Release: This special 16-page Starfinder adventure was created for Free RPG Day on June 16, 2018. The print edition will be available for sale and a free download will be available on paizo.com beginning July 1, 2018. Note: Due to the special nature of this product, it is NOT part of any subscription. running this game if you’re in search of a good Starfinder one-shot, and kudos to Paizo for making available at no cost! construct enemies, and he has no skills relevant to starship combat. player to make their own mystic rather than play Dakoyo. seems reasonable for a mysticism-challenged party. Skitter Shot is Paizo’s Free RPG Day offering for Starfinder in 2018. It’s a standalone, one-shot adventure that casts the players in the role of skittermanders, the delightfully friendly and (sometimes over-)helpful race of six-armed aliens that have become the game’s unofficial mascot through popular appeal. This review is based on playing through it once and then reading it. Overall, it’s a fun adventure that, despite a few flaws, should leave players in a good mood when they’re done with it. It’s really hard to hate skittermanders because they’re just so darned . . . helpful! 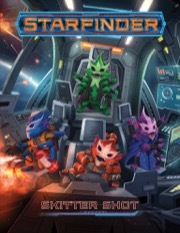 The premise of Skitter Shot is that a vesk space scavenger named Nakonechkin has hired a crew of four skittermanders to help him with his work. When Nakonechkin disappears while exploring a luxury liner that’s inexplicably drifting in space, it’s up to the skittermanders to find him and figure out what’s wrong. The answer turns out to be a rogue AI on the cruise ship that has turned the ship’s systems against its crew and passengers! To save the day, the skittermanders will need to disable the AI and fight off a hostile pirate ship. The inside front cover of the module provides the layout of the cruise ship, while the inside back cover provides a nice list of “10 Facts About Skittermanders” that should be read to players before the session. The module comes with a full-page character sheet for each of the skittermanders (they’re Level 2) that includes an entertaining bio and high-quality artwork. Each of the skittermanders has a distinct personality and role, which always helps to bring pre-gens to life. The adventure itself is divided into three parts. In Part 1, “Docking Procedures,” the PCs realize that Nakonechkin has been gone for too long and isn’t responding to communications. They’ll have to do a spacewalk over to the cruise ship (the “Emerald Empyrean”) and force their way through an airlock to gain entry. Apart from the risk of being struck by micro-meteteroids, this part’s pretty easy and straightforward. Part II, “Relaxation Protocols,” is where the adventure really heats up. The PCs have to fend off security robots who think they are “pets” and should be caged accordingly, robotic massage tables that have trapped Nakonechkin into an endless (and painful) massage, strange shadowy caterpillar-like creepers that have somehow drifted onto the ship from the Shadow Plane, a former crew member that has arisen as a cybernetic zombie, and more. The encounters are done well and are interesting, but I did find that as both a player and a later reader that it was hard to make sense of how some of the encounters could be traced to the rogue AI aboard the ship. There’s then a nice little conclusion that has Navonechkin offering the skittermanders their own ship as partners in his business, setting things up nicely for future adventures in future years. I would like to see more skittermander adventures in the future—they were fun and very different to the normal tone of the game; as long as they don’t get overused. Overall, although not perfect, you really can’t complain about such a well-done, professionally written and illustrated adventure that is 100% free. It’s an entertaining, welcome addition to what Starfinder has to offer. Announced for Free RPG Day 2018! Description and image are final. 2016 looks like a typo.looks fun and I hope skittermander don't gain time travel. Release: This special 16-page Starfinder adventure was created for Free RPG Day on June 16, 2016. The print edition will be available for sale and a free download will be available on paizo.com beginning July 1, 2016. What level is this and who is the author? Skittermanders are the new ewoks goblins. IIRC, the various WBG scenarios had semi-official (or even all-the-way official) 'extra' Goblin pregens made available, sometimes by the developers, allowing up to 6 people to play at once. Any chance of that happening here? Mainly asking for SFS, since obviously GMs can make their own extra Skitters in home games. Shouldn’t this be under Starfinder/Modules not Starfinder/Rulebooks? I am hoping to run this at my local store to generate more interest in RPGs in general. However, since he is mostly a MtG and Comic book store, he will not be purchasing a kit for Free RPG day this year. Is there any way that I can get a PDF copy prior to Free RPG day for both scenarios, so that I can print/bind/ and prep all the maps? Is this going to be available to VCs that have GMs that will run the scenario to generate interest? My VC is aware of the situation and stated he will try and help out. It'd be awesome if a PDF including chronicle sheets and the 4 pregen PCs can be posted early. I'd like to have laminated PC sheets for players sitting down for the demo, and obviously we should have chronicle sheets pre-printed. So how much time are the Free RPG Day mods expected to run? Its the first time my game store has participated but the owner wants all RPGs ran to last only 2 hours to maximize the number of people participating. But I argued that 3 hours would be better for the mods that come out that day. While i will only get the Skitter Shot module next week, from gamemastering experience of the "We be Goblins" modules, unexperienced players will need about 4 to 5 hours to play through the entire module. Experienced Pathfinder players can do it in 3h, but 2h seems impossible to me. So goblins and skittermanders for Free RPG Day, eh? I would say Marco Massoudi's assessment of time is spot on. Another thing that can make these run a bit longer is that while they get Organized Play sanctioning, they still are formatted as a standard module. That means there isn't nearly as much box text or "If the PC's ask the following..." elements to help streamline a session. Since this is the first Starfinder Free RPG Day offering, that may have changed but historically, that's how they have been presented. Free RPG day is next weekend, correct. The only thing that "We be Goblins" did far superior is having great individual minis available - we don't even have different Skittermander adults pawns in the Alien Archives box - there are six which look exacly the same - no different fur colors sadly. Yeah, but it was years before we had We Be Goblin minis. Give it time. Plus, once you have the module its not that hard to make pawns for the Skittermanders. I did, it took me maybe an hour from scanning to finished pawn. What level character does the PFS chronicle get applied to? Pregenerated characters and sanctioning document are now available for download! It seems there is a small error in the character sheets. The attack bonuses of tactical batons and survival knifes are wrong because they are operative weapons and should use the Dex bonus. I just read the chronicle sheet. Question: Does the Playing/GMing "An Entire Adventure Path Volume" mean all 6 parts of an AP, or just 1 part? And if we're GMing either a scenario or the AP in 'Campaign Mode' does the GM sign it, or do we need to find a VO or something to sign on top of that (for the GM)? The line about the Event Coordinator is the part that's confusing. I think GM's can be their own Event Coordinators, but I'm not sure. If GM's are allowed to sign their own boxes (for scenarios/APs they run), should they note the chronicle sheets that apply on this chronicle sheet? Also, I take it this is NOT an 'evergreen' adventure, despite the low level? So I have a question does the GM get boxes for running Skittershot on Saturday. They'd get them if they GMd it multiple times. It specifies you don't get a box for the scenario you received the chronicle for. If they GMd in the morning, played it in the afternoon, then GMd it again in the evening they should get three or four boxes checked off. Depending on if they have rsp or not. • 2 boxes for playing an entire Adventure Path volume. • 2 boxes for GMing 4 hours of quests, a scenario, or a 16-page module. • 3 boxes for GMing an entire Adventure Path volume. • 3 boxes for GMing at an event that received Paizo Event Support or a Regional Support Package. The bold part is the only part saying when you cant get credit for it. Scenario is yet to come, but in event reporting form there is its option - and there are still no such options for Dead Suns IV and V. How is that? Two characters argue in front of a post with several notices nailed up, saying the name on the sheet behind the one they've just torn off. Two characters look the remaining sheet hammered to the post and turn to the camera. Any chance PDF's of the maps will also be released? We'll we be able to aplly credits retroactively for this boon? I didn't see any dates restrictions like for eox elabrian boon. Boons of this nature rarely allow you to retroactively check things off. I believe its safe to say that if it was going to allow that it would have included the wording in the boon itself, likewise it wouldn't have an issue of you checking a box for playing the scenario itself. Retroactive activated boons can cause unforeseen consequences. They could have at least allowed GM credits to be applied retroactively. Why? One of the obvious goals of the boon is to get people to gm more. I really like the art for the skittermanders in this. Way better than the Alien Archive. Is this item going to be available to buy in print on the site? I had to work on FRPG day and was unable to get my own copy. It should be on july 1st or 2nd. I have two copies, it is certainly worth buying imo. It says the release date in the description: "The print edition will be available for sale and a free download will be available on paizo.com beginning July 1, 2018." July 1 is a Sunday so I wouldn't expect to be able to order the print copy until july 2.